Are you curious? Do you like to find out how things get done? If I get a taste of something good or if someone tells me about a recipe she loves, I need details. What’s in it? How’s it made? Where’d it come from? May I share it? Those are my 4 questions. 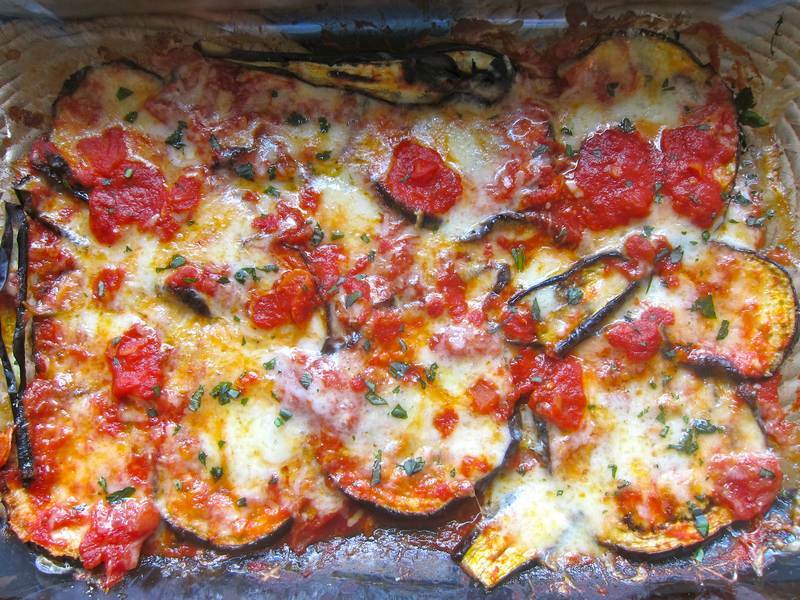 Thanks to my need-to-know, you can indulge in Gabrielle Pasin‘s amazing new take on eggplant parmesan, Single Layer Eggplant Zucchini Parmesan. Turn oven on to broil. Spray a large roasting pan lightly with olive oil. 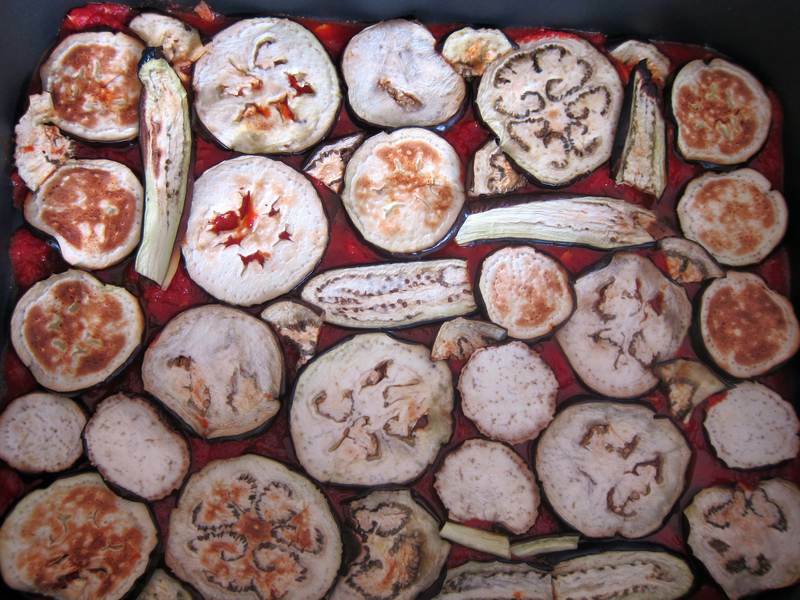 Broil eggplant and zucchini, in a single layer, about 6 minutes per side or until lightly browned and softened. 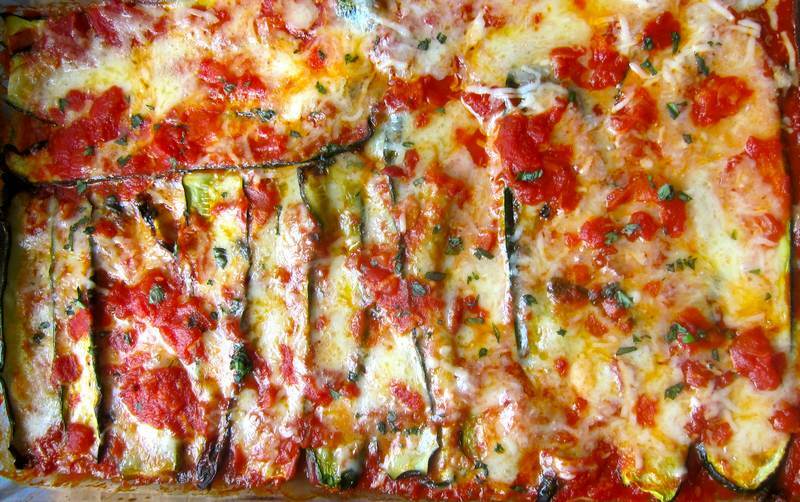 Repeat as required to broil all the eggplant and zucchini. In a medium sized pot, heat olive oil over medium-high heat, then cook onion, covered, on low for 6 minutes. Add garlic and simmer, stirring for 3 minutes. Add tomatoes with their juices, tomato sauce and roughly chopped basil. Simmer for 45 minutes. Preheat oven to 350F. Coat the bottom of three of your largest baking dishes with a thin layer of sauce. 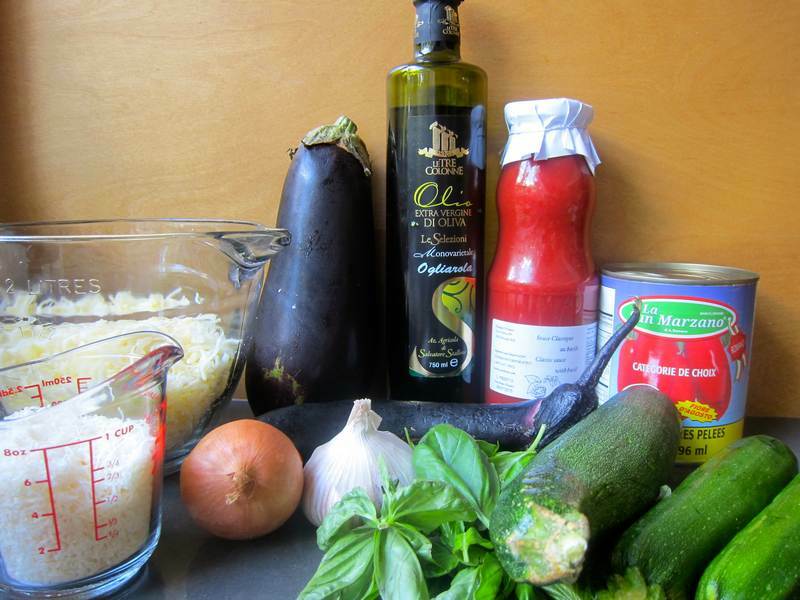 Lay out a single layer of roasted eggplant and zucchini. Cover with a layer of sauce. Sprinkle on cheese. Bake for 20 minutes or until bubbly hot. Garnish with finely chopped basil. Serve as an appetizer with salad or as a side dish. Perfect on a buffet table. Serves 12-15. Can be frozen. Buy Fitness Rolls and sliced provolone from Cavallaro, then make a grilled sandwich with two slices of provolone, a layer of basil and some good quality sun-dried tomato paté. Throw in a little avocado, and you will be rewarded with the best tasting sandwich e-v-e-r! Everybody is touting the benefits of eating raw garlic. Are you game? Harriet Sugar Miller shares guidelines on how to maximize your garlic health rewards, such as: Crush the garlic and let it sit for a few minutes before devouring. In my dreams I’ve always been a ballet dancer. These photos bring ballet to life. Welcome! It tastes way better than it looks! I need computers to start offering tasting samples. Looks amazing! I may try it tonight! Thanks so much for including a link to Bamitbach!! My pleasure! Had fun checking out your blog. This looks fantastic, but it makes soooo much!! Good thing it can be frozen! Bet you’ll be pleased to have it on hand. We managed to polish it off rather easily. Hope you enjoy. Made it again yesterday and it remains a big hit!